Not many authors happen to have a close relationship with a police officer who has years of experience of policing in the UK that they can call upon to answer accurately and reliably, their troubling questions about the police, their policies and procedures. A Writer’s Guide to Senior Police Investigators in the UK will prove indispensable to those not in this position, who wish to bring authenticity and realism to the lead detective and senior investigators in their writing. Inside you will find details of what exactly a lead investigator and Senior Investigating Officer is, how they become one, what training they undertake and what 38 qualities and expectations they are expected to exhibit. You will also find 27 specific ideas of how to take your stories forward and/or create conflict in them. There are also hyperlinks to 79 websites or documents that you may find useful in building up your understanding of what a Senior Investigating Officer needs to know and apply during a major investigation. All of this invaluable information can’t help but allow you to create a convincing, believable story. then this is the ideal book for you regardless of the genre you are writing in. Go down the traditional publishing route and you will find an editor telling you to get your policing facts checked out: go down the self publishing route and its down to your own self discipline and professionalism. 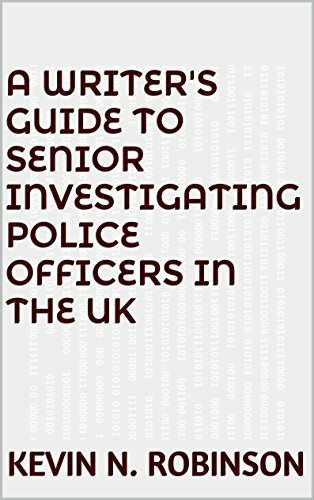 Treat yourself to A Writer’s Guide to Senior Police Investigating Officers in the UK and turn yourself from a nervous, unsure novice to a confident, professional author. The facts you find in this book will help you decide whether you are going to tell or show in your story and to create and develop believable characters regardless of whether they are heroes or villains. Easily refer back to the facts anytime, regardless of whether your compiling your first draft or editing and revising your umpteenth work in progress. You’ll find this book is easy to navigate and may even help sell more books to a discerning readership.